This included 3,000 in Paris, according to official figures. There were also protests in Nantes, Montpellier, Toulouse and Rouen, among others. This is less than the previous low of 32,000 seen during “Acte 7” on December 29, the weekend before the New Year. Yet, protesters continue to dispute the official figures, saying that many more were present. The weekend marked the last Saturday before the final day of President Emmanuel Macron’s Grand Débat, which is set to conclude next week. Yesterday (Saturday March 10) in Paris, protesters were stopped from continuing on their planned route to the Champ du Mars, as law enforcement blocked them from approaching the area around the Eiffel Tower. Another authorised protest march saw “gilets roses (pink vests)” take to the streets to raise awareness of issues such as sexual harassment, domestic violence, and unequal pay. Many of the women on this march were nursery and Reception (maternelle) class assistants, who were protesting reforms to their unemployment insurance system. The “gilets roses” march had been announced in the wake of this week’s International Women’s Day. Overall, the day passed without much serious incident, but some tensions erupted at the end of the day, prompting the use of tear gas and water cannon by law enforcement towards some. 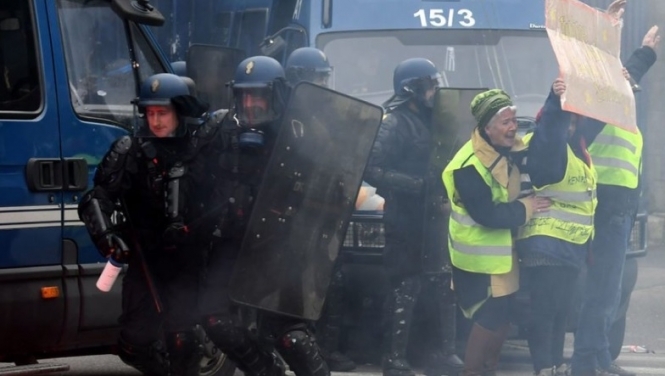 The latest protests come in the same week as France was placed on a police violence list pending investigation by the United Nations High Commissioner for Human Rights, in the wake of the use of batons, tear gas, water cannon, and defence ball launchers (LBDs) during the movement. Despite what has been described as a “low” weekend, the gilets jaunes movement has now called for a renewed effort next weekend, as Mr Macron’s Débat comes to an end on March 15. They have called for “the whole of France to come to Paris (La France entière à Paris)” with a view to sending “an ultimatum” to the government.